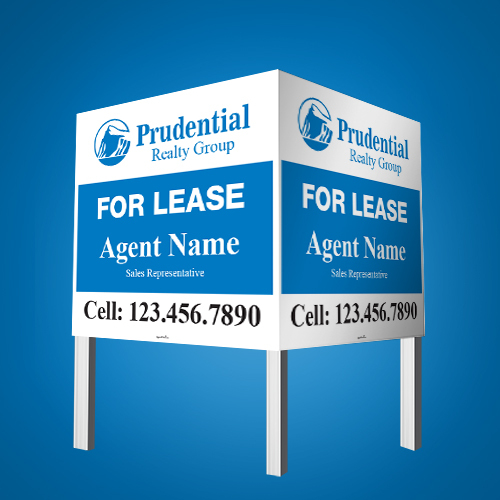 Prudential agents can now promote real estate properties in a big way using a high quality, single-sided commercial sign. Available in Coroplast and Crezon material, our attention-grabbing large commercial signs have plenty of curb appeal and are ideal for highlighting commercial properties. Add Lamination for extra durability and Writability. Liquid Lamination - Offers great printed surface protection. Due to the large dimension of the commercial sign, they will have to be folded before shipping. The folding of this sign will not alter the structure of the sign in a significant way. The fold line will not be noticeable once unfold. **If you do not wish for your commercial sign to be folded, please pick-up from our location. ***Crezon Board cannot be shipped due to its extremely heavy weight and they cannot be folded. Select a template from us, then modify it with your information. Already have a design file? Upload here.